A couple of months ago, I mentioned there was a new book club for booklover's based in Lagos. Well the second meeting is almost here. "The Lagos Book Club is a free club catering to young women living in Lagos and those who have moved back to Lagos after living outside the country. The main criteria: be open to discussions and like good books". 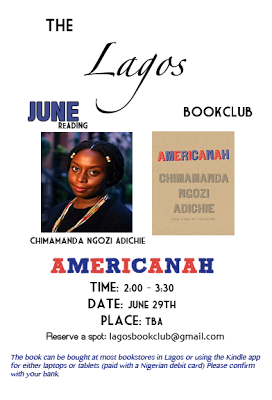 June's book is award-winning author, Chimamanda Ngozi Adichie's much anticipated novel, Americanah. Spanning three continents, this is a story of love and race between a young man and women from Nigeria. It was published in 2013 by 4th Estate in the UK and Farafina in Nigeria. It can be found in most major bookstores in Lagos and an excerpt can be read here. Chimamandan Ngozi Adichie was born in Nigeria in 1977. Her first novel Purple Hibiscus (2003) won the Commonwealth Writers' Prize for Best First Book in 2005. Her second novel Half of a Yellow Sun (2006) won the Orange Prize for Fiction in 2007. The second meeting is scheduled for Saturday June 29th. Venue, TBC, but if you're interested in joining do send an email to lagosbookclub@gmail.com for more details and to also reserve a spot. As I said the last time, what's there not to love? A place where book lovers can meet, share their interests and discuss books. And it's free :). I'm also seriously jealous about June's book selection. If I was in Lagos, I'd definitely be there. So send an email, get a copy of the book (if you haven't already got it) and enjoy!!! I've just seen this Zahrah! Thanks again for spreading the word :) The next book club meeting is now open to men as well.